ASC management is no easy task. Besides overseeing the operations of a facility expected to provide exceptional surgical care that delivers optimal outcomes, management must work to meet the needs of its physicians while also overseeing a diverse staff fulfilling a wide range of positions and responsibilities. Here are eight tips covering areas such as physician engagement, recruitment, staff performance, and technology that can help make the challenging work of an ASC manager a little easier and more productive. An effective ASC manager can accomplish a great deal without much assistance, but it sometimes helps to have additional leadership support. This is particularly true when issues arise that require the involvement of physicians and/or the governing board. Enter the "physician champion." This is a physician an ASC manager can rely upon for a number of purposes. The champion can help overcome communication issues and other bridges that may exist between a manager and physicians/board members. The champion can be called upon by a manager to support initiatives that are in the best of interest of the ASC but may still face resistance from others. The champion can be relied upon to provide insight and guidance on issues, when requested by the manager. In addition to working well with the manager, a strong physician champion will be respected by peers and staff, be an effective communicator, and have a strong grasp of ASC operations, both clinical and financial. It is also particularly beneficial for the champion to serve on the board so this individual will be present at board meetings. Governing board meetings are pivotal to an ASC. They represent a designated time to tackle regulatory issues required for compliance. They provide an opportunity to discuss problems and solutions. They also serve as a forum for short- and long-term planning. Governing board meetings must accomplish all these objectives and do so while keeping board members actively engaged enough to participate and contribute. That's why it's important to determine an appropriate length for board meetings and never start late or run long. An hour tends to be enough time to work through a full agenda. It's also a reasonable amount of time to request of board members on a periodic (e.g., quarterly) basis. If you plan to start your board meeting at 6:00 p.m., make sure it actually begins at 6:00 p.m. If you plan to end at 7:00 p.m., be prepared to do so, moving through agenda items in a timely fashion to cover everything you need to. If you stick with this approach, board members will know they are expected to be engaged participants for that hour. If you start a little late, you may find yourself rushed to cover everything on the agenda. In addition, board members might show up a little late for future meetings if they do not believe your designated start time is actually the start time. If you try to keep board members past your designated end time because you started late or planned the agenda poorly, some board members may leave the meeting at the end time or start looking at the clock impatiently, thus losing their full engagement. Poorly run board meetings also do not reflect well on a manager's management skills. Most ASC governing boards expect their managers to take care of day-to-day issues that require small, easy fixes. That expectation can extend to some larger issues in areas including human resources and purchasing. But sometimes there are more significant problems and matters that require governing board involvement and decision making. When these issues arise, ASC managers should put together an easy-to-digest summary of the issue to help board members quickly get up to speed on the problem and its cause(s). The manager should also prepare possible solutions board members can consider. It is advisable that managers note which solution they recommend and secure support for that advice from the physician champion. Such preparation will help move board discussions forward, preferably to the solution that the manager, who should have spent ample time researching the issue and evaluating solutions, recommends. With increased competition for staff, many ASC managers are finding it more difficult to recruit qualified professionals when job openings arise. Social media can be an effective tool — and one that is often overlooked — for a manager seeking to add staff. Some platforms offer the ability to post openings in sections designated for that purpose either for free (usually with a paid option to extend the posts reach) or a fee. Some platforms offer the ability to join (or request to join) groups of professionals who have worked or currently work in the positions you are looking to fill. These groups may have a process through which you can share job openings. Another advantage of social media is the ability for users to share (sometimes via "tagging" another user) an opening with others, helping extend your reach. When you are looking to fill an opening, ask current staff members in that same position or department which social media platforms they use and if they would recommend any of these platforms for job recruitment. You may also want to inform staff when you use social media to announce a job opening and encourage staff to share the information with anyone they think may have interest in applying. Another way to expand the search for new staff and physicians is to call upon existing staff and physicians for recommendations. They may know of other professionals, either from previous positions/facilities or industry meetings, who are looking for work or a new place to perform procedures. One potential source of good information ASC managers will not want to overlook are their anesthesia providers. 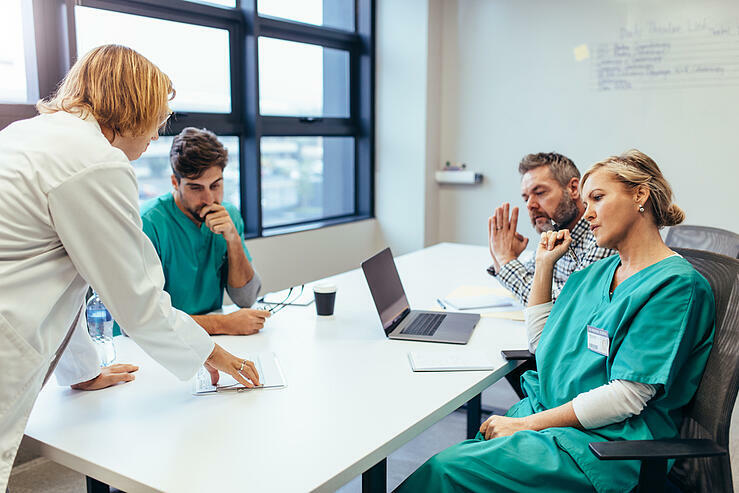 Anesthesia groups often provide services to multiple facilities, and anesthesia providers can develop close relationships with staff and physicians. This puts these providers in a position to gain insight into individuals considering — or willing to consider — making a career change that may be strong fits for openings. With so many responsibilities, ASC managers cannot afford to micro-manage projects. Managers must have confidence in their staff to accomplish what is asked of them, as long as what is requested is reasonable (when considering the roles staff were hired to fill and the skills sets required for these positions) and as long as managers are willing and able to provide staff with any resources the task requires. When staff are provided the freedom to work and not have a manager looking over their shoulder every step of the way, they are more likely to take pride and ownership in their work and performance. It's not easy to manage a successful ASC. Increasing requirements, tightening reimbursement, higher costs, and greater competition for everything from staff to managed care contracts are just a few of the challenges ASC managers face every day. With these challenges comes a need for ASCs to perform at a level that ensures the delivery of great outcomes at a low enough cost to keep the business solvent. This level, suffice it to say, must be high. As such, managers should set comparably high expectations for staff. Managers should inform staff about what is required for a successful ASC and the specific roles staff play in helping ensure such success. Once these expectations are laid out clearly, managers must hold staff accountable to them. Part of this accountability requires managers to fulfill their own responsibilities as managers and help staff meet these expectations and achieve their professional potential in the process. There may be no easier or more effective way to achieve across-the-board improvements in ASC management than investing in technology. The right ASC technology — designed with features and functions specific for surgery centers — can provide managers, staff, and physicians with powerful tools that support more timely, appropriate (i.e., evidence-based) decisions and support faster, streamlined completion of essential tasks. Such technology can transform the way an ASC performs scheduling and documentation; accomplishes critical revenue cycle, human resources, and inventory tasks; and achieves team coordination and communication. With access to an ASC analytics solution, a manager can drill down into the ASC's performance in these and many other areas to identify areas for improvement and gain a stronger understanding of the trends and developments driving operations. With the right ASC technology, a manager can better ensure staff are consistently performing at their highest level. When staff are successful in their work, there is a wonderful trickle down effect: physicians tend to be happier, and, most importantly, patients typically receive better care. And this is the ultimate measurement — and representative — of a manager's success.